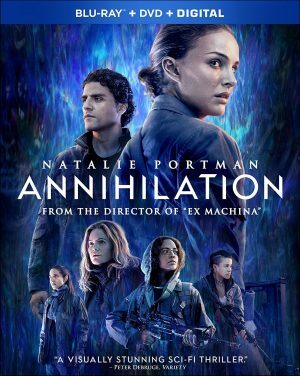 Director Alex Garland’s (“Ex Machina”) “Annihilation” debuts on Blu-ray Combo Pack and DVD Tuesday May 29, from Paramount Home Media Distribution. The futuristic action film is also available on Digital. 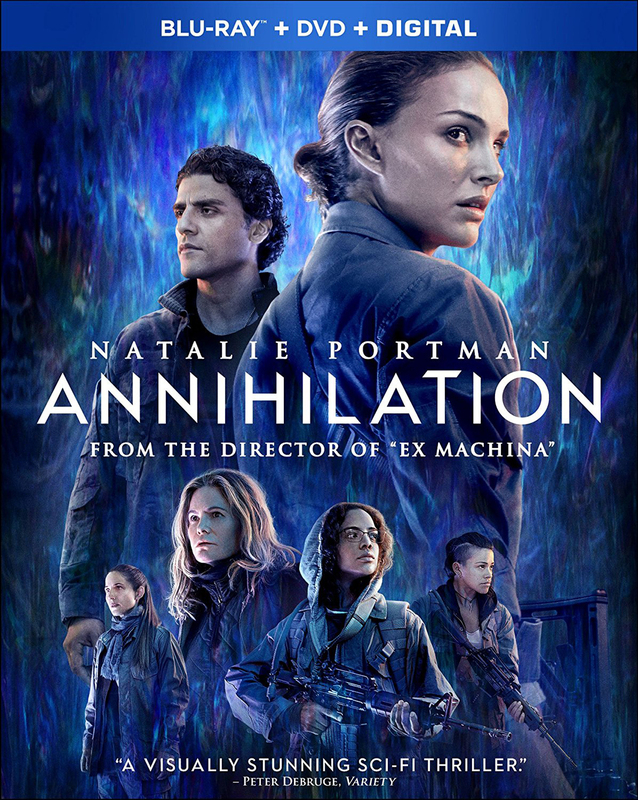 Biologist and former soldier Lena (Academy Award winner Natalie Portman, “Black Swan”) is shocked when her missing husband (Oscar Isaac) comes home near death from a top-secret mission into The Shimmer, a mysterious quarantine zone no one has ever returned from. Now, Lena and her elite team must enter the beautiful but deadly world of mutated landscapes and creatures to discover how to stop the growing phenomenon that threatens all life on Earth. The film also stars Jennifer Jason Leigh, Gina Rodriguez, Tessa Thompson and Tuva Novotny in this female-centric action movie. The “Annihilation” Blu-ray Combo Pack includes more than an hour of bonus content. Portman, director Garland as well as other cast and crew members take viewers behind the scenes for a deeper look inside the film’s stunts, intricate set design and breathtaking visual effects. The cast and crew also share their fondest memories about making the film. The Blu-ray boasts a Dolby Atmos soundtrack remixed specifically for the home to place and move audio anywhere in the room, including overhead. The DVD feature film appears in standard definition. Fans of the long-running “Jackass” franchise, this one’s for you. Enjoy every death-defying stunt and hilarious prank can be enjoyed all over again with “Jackass: Complete Movie and TV Collection,” available Tuesday May 29. The 11-disc DVD set features Johnny Knoxville, Bam Margera, Steve-O, Chris Pontius and Jason “Wee Man” Acuna, and includes all seven movies as well as the entire TV series. Boasting 16 hours of extreme stupidity, this definitive collection includes “Jackass: The Movie,” “Jackass Number Two,” “Jackass 2.5,” “Jackass 3,” “Jackass 3.5,” “Jackass Presents Bad Grandpa,” “Jackass Presents Bad Grandpa .5,” and all 25 episodes of “Jackass” the TV series, which ran for three seasons in the early 2000s (unrated, of course). Never before has arrested development looked so fun. After a sold-out release of “Terrifier,” Epic Pictures’ horror label, Dread Central Presents, is coming out with a collector’s edition Blu-ray/DVD Combo Pack of its elegantly haunting supernatural thriller “The Lodgers” Tuesday May 29. In this gothic supernatural thriller, a family curse confines orphaned twins Rachel (Charlotte Vega, “The Misfits Club”) and Edward (Bill Milner, “X-Men: First Class”) to their home as punishment for their ancestors’ sins. Bound to the rules of a haunting childhood lullaby, the twins must never allow any outsiders inside the house, must be in their rooms by the chime of midnight and must never be separated from one another. Breaking any of these rules will incur the wrath of a sinister presence that inhabits the house after midnight. While Edward is committed to this ill-fated life, he’s becoming more unhinged due to the fact that Rachel is not. Smitten by a local soldier (Eugene Simon, “Game of Thrones”), Rachel grows skeptical of the strict rules and begins to rebel, desperate to escape the oppression and misery of their captivity. Loaded with special features, including a 22-minute behind-the-scenes documentary, two deleted scenes, trailers and more, the Blu-ray/DVD Combo Pack of “The Lodgers” also can be enjoyed in several languages: Castilian Spanish, French, German and Portuguese as well as subtitled in Latin American Spanish, French, German, Portuguese, Danish, Finnish, Norwegian, Swedish, Dutch and Romanian. Winner of several awards, “The Lodgers” had its world premiere at the Toronto International Film Festival and was closing night feature at the 50th Sitges Film Festival. Directed by Brian O’Malley (“Let Us Prey”) and written by David Turpin, the film also stars David Bradley (“Harry Potter” films) and Moe Dunford (“Vikings”). “The Lodgers” is available in an all-region compatible Blu-ray/DVD Combo Pack for $14.99 (SRP). In celebration of its 65th anniversary, Disney’s beloved flight of fantasy, “Peter Pan,” joins the celebrated Walt Disney Signature Collection, landing in homes on Digital and Movies Anywhere Tuesday May 29 and on Blu-ray June 5. With a little faith, trust and pixie dust, viewers can allow their imaginations to soar on this epic adventure to Never Land, sparkling with colorful animation, extraordinary music and all-new and classic bonus features. Fantastic adventures await the Darling children—Wendy, John and Michael—when Peter Pan, the hero of their stories, whisks them away to the magical world of Never Land. 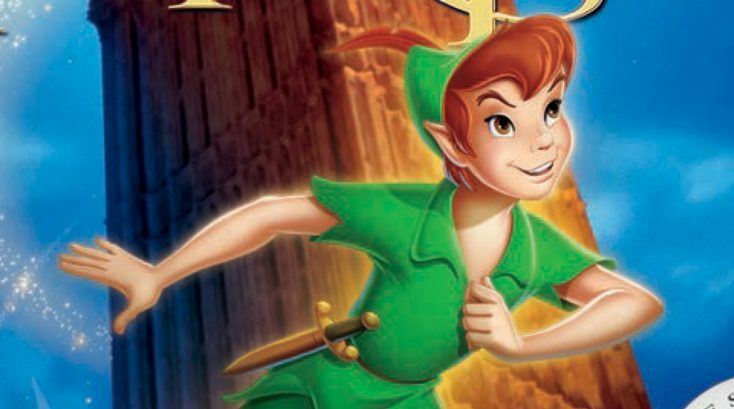 After flying with Peter and the impish Tinker Bell past the “second star to the right and straight on till morning,” they explore the enchanted island and Peter’s secret hideout with the Lost Boys, and leap into high-flying battles with swashbuckling pirates and the infamous villain Captain Hook. The fun-filled family adventure “Paws P.I.,” arrives on DVD, Digital and On Demand Tuesday May 29 from Lionsgate. Comedian Jon Lovitz highlights this family action-comedy as Jackson, the world’s first canine private eye. Jackson’s eager to help his pal Peter recover a missing will for Katherine, a hardworking veterinarian. To break into a mansion and retrieve the priceless document, Peter joins forces with his pretty neighbor Madison and her sassy poodle Cleo. With stuffy British parrot Peabody working surveillance from above, the human-animal squad battles bumbling henchmen to find the will and save the day. Discover how Jackson and his furry and feathered friends help put Katherine’s uncle behind bars. Approved by the Dove Foundation for all ages, the “Paws P.I.” DVD will be available for the suggested retail price (SRP) of $14.98. The final season of the BAFTA award-winning BBC comedy “Detectorists: Series 3,” makes its DVD debut from Acorn TV Tuesday May 29. Mackenzie Crook (“Game of Thrones,” the UK’s “The Office”), who also wrote and directed the series, and Golden Globe- and Emmy-nominated actor Toby Jones (“Harry Potter” series, “The Hunger Games”) stars as two oddball metal-detecting enthusiasts scouring the English countryside for treasure while dealing with their messy personal lives. Rachael Stirling (“The Bletchley Circle”), and her real mother, Diana Rigg (“Game of Thrones,” “Victoria”) also star. The two-disc DVD set features all six episodes of the third season, plus bonus behind-the-scenes cast interviews and behind-the-scenes featurettes ($39.99, Amazon.com). “Detectorists: Series 3” made its exclusive U.S. premiere in January on Acorn TV as an Acorn TV Original Series. Acorn TV’s development division, Acorn Media Enterprises, co-produced the final season. Acorn TV is North America’s most popular streaming service focused on British and international television from RLJ Entertainment. To save up money for a place of their own, Andy (Crook) and his wife, Becky (Stirling), have moved in with Becky’s formidable mother (Rigg), and Andy’s new position as an archaeologist is not the dream job he thought it would be. Lance (Jones) worries that having his daughter live with him is causing problems for his girlfriend. To top it off, Andy and Lance may lose their favorite detecting field to the construction of a new solar farm. This engaging comedy continues to unearth the hidden depths of those who call themselves detectorists. Tackling thorny themes in today’s complex world, Acorn TV features the DVD debut of the gritty and cinematic crime series “East West 101: Series 2” Tuesday May 29. Set within the Major Crime Squad in metropolitan Sydney, Australia, this popular TV series is based upon the experiences of actual detectives in a crime unit in Sydney’s western suburbs and deals with the clashes of culture, socio-economic statuses, and religious tension in Australia. Winner of numerous prestigious TV awards in Australia, “East West 101” portrays the complex dynamics of a multicultural society in a realistic and riveting way. The two-disc DVD set features all seven episodes of the season, plus a bonus behind-the-scenes featurette ($39.99, Amazon.com). “East West 101: Series 2” is also available on Acorn TV. The critically-acclaimed drama returns for the second season with new perils for Detective Zane Malik (Don Hany, “Serangoon Road”), a Muslim Arab living in post-9/11 Australia. After a deadly car bomb goes off in a Sydney suburb, fear and suspicion thrive as the community blames it on Islamic extremists. However, Malik is not convinced it was a terrorist attack, and he joins a joint task force led by Agent Richard Skerritt (Gerald Lepkowski, “The Death of Stalin”). The investigation throws Malik into a high-stakes undercover mission targeting a suspected arms-dealer, but the job takes him away from his family and even threatens their safety. Meanwhile, Malik’s boss, Inspector Patricia Wright (Susie Porter, “Janet King”), deals with a personal crisis that stirs up painful memories from her past. This week, Front Row Features has a giveaway for every type of cineaste in the family. For comedy fans, we’re giving away two copies of the 11-disc “Jackass Complete Movie and TV Collection” on DVD featuring all seven “Jackass” movies plus the hilarious MTV series that started it all; for sci-fi film fanatics, we’re giving away two copies of the visually stunning thriller “Annihilation” on 4K Blu-ray—a Best Buy exclusive; and for kids and kids at heart, we’re giving away three digital copies of the “Peter Pan” Walt Disney Signature Collection release a week before its Blu-ray debut, which boasts all-new bonus features about the classic animated film. To enter the contests, simply email socalmovieeditor@aol.com by June 4 with the title of which movie you want to win in the subject line. Good luck! Next PostPhotos: ‘Annihilation,’ ‘Jackass,’ ‘Peter Pan’ Signature Collection Edition, More on Home Entertainment … Plus Giveaways!! !